In the past few months, I’ve received several questions about performing handstand pushups from homemade (PVC) parallettes.Â The PVC parallettes were added to the homemade equipment archive several months ago. Unfortunately, I do not have experience with PVC parallettes.Â I’ve never built them, nor have I used them.Â I have seen a few videos of handstand pushups performed from PVC handles, but I do not know the weight limit.Â I’m guessing that smaller athletes wouldn’t have any issues.Â As for the heavyweights (or those using weighted vests), I honestly do not know. Personally, I built handstand pushup handles from wood and pipe.Â The handles are very strong and are tall enough to maximize range of motion.Â I made these handles a few years ago from scrap wood that was leftover from another project. A picture of one handle can be seen below. The gripping area is made from a 6 inch piece of pipe (3/4″ thick).Â Each end attaches to a 90 degree elbow, which then attaches to a pipe flange.Â It’s been a few years since I built the handles, but I’m guessing the pipe cost around $15. As for lumber, I screwed each pipe flange to a 4×4″ piece of wood.Â The 4×4’s then attach to a 2×10″ piece.Â Finally, the 2×10″ has a 2×4″ on each end to stabilize the high handles. My initial reason for tackling this project was that I wanted a tall enough handle to allow for a full range of motion (without compromising stability).Â The 4×4″ pieces are 12 inches long.Â As you can see below, I’m able to lower myself fully with each repetition.Â The taller pushup handles that I had seen on the market lacked stability.Â My DIY handles are very strong and are quite stable on the ground.Â There is no tipping or rocking. I also enjoy these handles as I can vary my hand position. I realize that this DIY project may not be the most popular or exciting, but the handles have been quite useful over the years.Â Looking back, I may not have taken on the project if I didn’t already have the scrap wood.Â I’m glad I did however as I’ve gotten plenty of use from these handles. As for the PVC parallettes, they are certainly less expensive to build if you needed to purchase the lumber for my handles.Â I will say however that it is nice to have a solid handle underneath you when standing on your hands. They look solid and extremely safe. There are actually so many DIY home gym projects one can make, but I, unfortunately, am no good with these sorts of things so I’m left just staring at them in wonder from my monitor, hehe. whoa, these things rock. You can move them, right? If so, it seems like you could dress them with some anchoring weight and get some nice farmer carries out of them. In any event, great job. Love the clean design. Excuse my ignorance, but why not use the ground? To be able to dip furher down? Ben – Yes, they are portable. Different hand positions are illustrated above. As for farmer’s walk handles, I’d opt for separate construction. You can likely build something with pipe, but I’d leave out the wood. 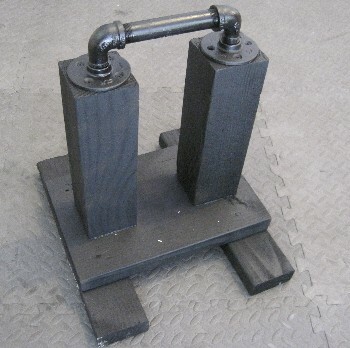 ar14d – Pushup handles on top of cement blocks can work, but are not too stable. I prefer the stability of the DIY version. 2 sturdy chairs will do the samething. I made some pvc paralettes and I do get nervous when they bend and flex. Mine actually exploded the first time I used them because I didn’t connect them well enough. Might have to make some of these! Nice build quality on those handles. They look to service their purpose well. Preferable to chairs and/or “block” and such in my opinion. These are great. I think I’ll go home and see if I have the scrap wood to make them myself. Did you use super thin pvc pipe? Try 2″ or something like that. And you should make sure you use the correct pipe cement plumbers use to put them together with elbows or t’s. They shouldn’t be exploding on you. For those wanting information about PVC paralettes, I built a pair a few month ago. PVC is incredibly strong (I did not knew that) I can do handstand push ups using them without any problems. My bodyweight is about 205 Lbs and when I stand on them they look as if there is no weight on them. I used PVC tube for hot water, they are thicker. Be sure to put them good together with PVC glue. You don’t find many chairs this sturdy nowadays zero, and their backs would usually be much higher than this.